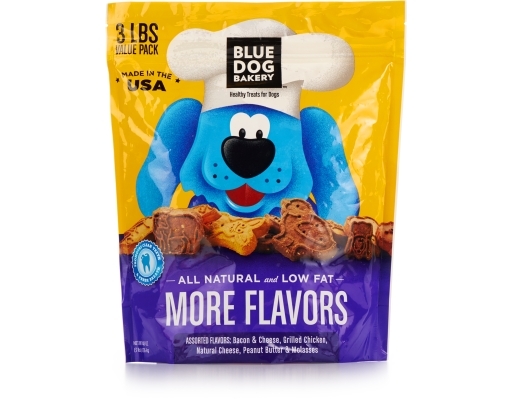 MORE Flavors treats are perfect for any pooch that believes variety is the spice of life. 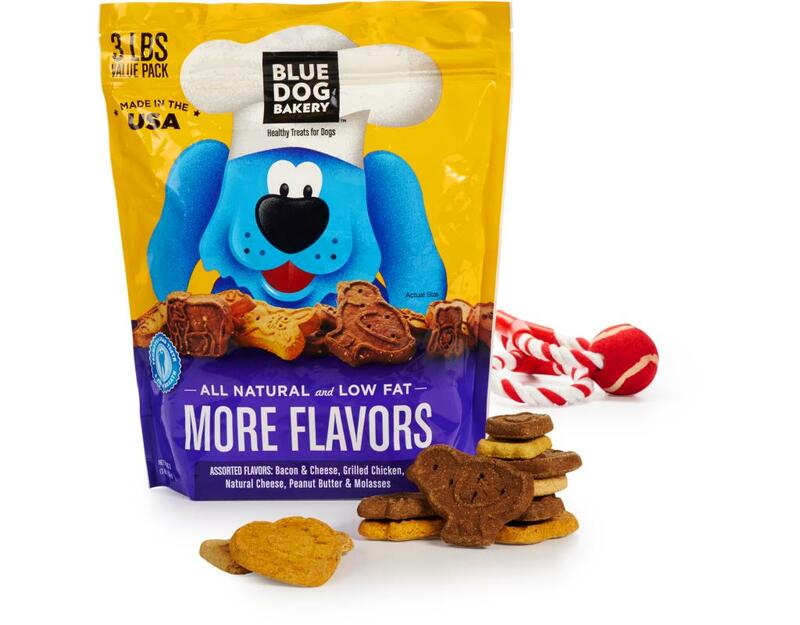 Blue Dog’s low fat treats are baked with an extra crunch to help clean teeth and freshen breath. • Clean Teeth & Fresh Breath: Crunchy treats to support healthy teeth and gums. 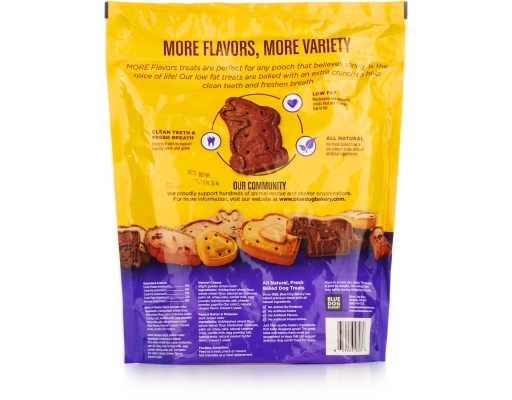 Bacon & Cheese Flavor (Slight Orange Color): Unbleached Wheat Flour, Whole Wheat Flour, Cane Molasses, Palm Oil, Whey, Oats, Nonfat Milk, Egg Powder, Baking Soda, Salt, Natural Bacon And Cheese Flavors, Brewer's Yeast, Cheese Powder, Annatto (For Color). 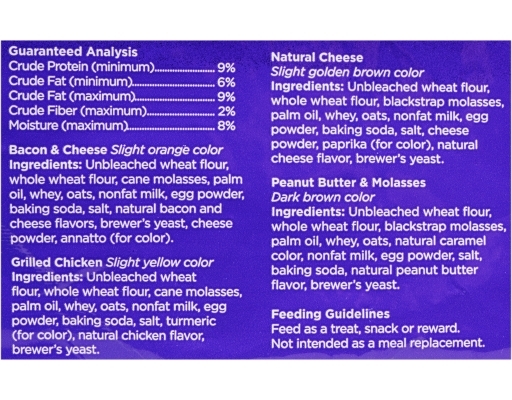 Grilled Chicken Flavor (Slight Yellow Color): Unbleached Wheat Flour, Whole Wheat Flour, Cane Molasses, Palm Oil, Whey, Oats, Nonfat Milk, Egg Powder, Baking Soda, Salt, Turmeric (For Color), Natural Chicken Flavor, Brewer's Yeast. Natural Cheese Flavor (Slight Golden Brown Color): Unbleached Wheat Flour, Whole Wheat Flour, Blackstrap Molasses, Palm Oil, Whey, Oats, Nonfat Milk, Egg Powder, Baking Soda, Salt, Cheese Powder, Paprika (For Color), Natural Cheese Flavor, Brewer's Yeast. Peanut Butter And Molasses Flavor (Dark Brown Color): Unbleached Wheat Flour, Whole Wheat Flour, Blackstrap Molasses, Palm Oil, Whey, Oats, Natural Caramel Color, Nonfat Milk, Egg Powder, Salt, Baking Soda, Natural Peanut Butter Flavor, Brewer's Yeast.